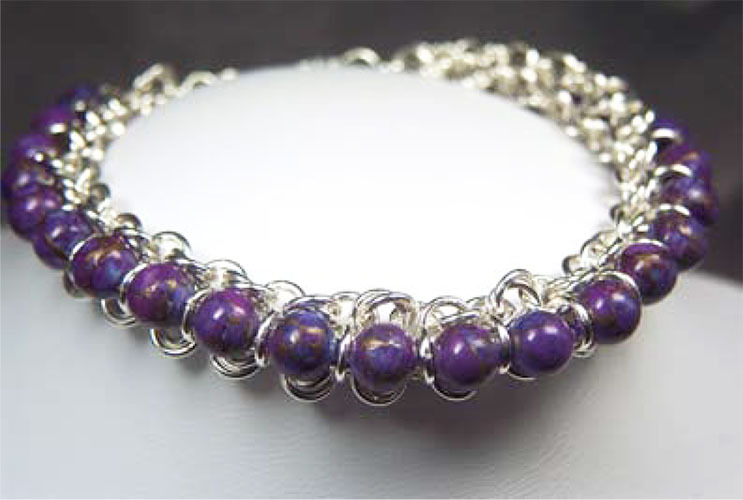 This chain maille bracelet seems difficult, but can be done by those with a basic knowledge of chain maille. If you can open and close a jump ring correctly, you can make this design. Pattern sold here is for a 7.5 inch (19.1 cm) wrist, but you can easily customize your bracelet if this is not your size. You might be wondering what those stones are that are bezel-ed in chain maille. These are blue compressed Kingman turquoise, infused with bronze metal (to create a matrix), heat-treated and stabilized. You can still see some of the turquoise-colored parts of the stone, as well as the varying shades of purple. What makes these stones so unique is the bronze infusion. Sources for some of the harder-to-find materials, such as these stones, are included in the pattern instructions. The sterling silver lobster clasp is attached so that it will lie flat against your wrist and is very comfortable. Pattern includes a material list with sources for beads, and suggested materials that will ensure strength, stability and success with this pattern. Step-by-step instructions include pictures.